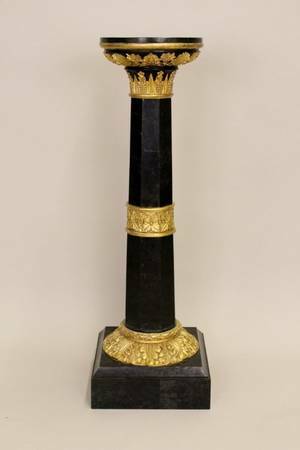 A Black Marble & Gilt Wood Pedestal. 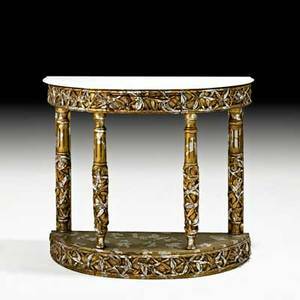 Floor pedestal with banded gilt wood foliate decoration. 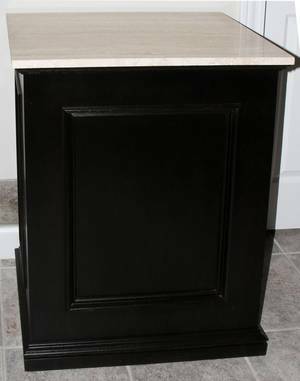 Round top and square pedestal base. Column octagonal in form. Height 46.5 inches. Diameter of top 12.6 inches. Base 15.25 inches square. 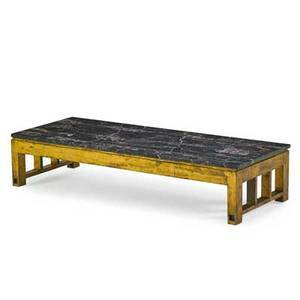 Archived auctions similar to A Black Marble & Gilt Wood Pedestal. 062288: GILT WOOD PEDESTAL, C. 1900, H 51"
062096: CARVED & GILT WOOD PEDESTAL, H 49", DIA 16"
James mont; james mont design; demi-lune console, usa, 1960s; marble, gilt wood; unmarked; 31" x 36" x 12"